Are you an aspiring writer who would like to get paid to review products you were going to buy anyway? One of the biggest perks of niche reporting—the art and craft of reporting on a particular subject category—is scoring free review copies of the latest products and media in your field. In order to stand out, you need to have a good idea of how to write the kind of review readers are looking for. That means an understanding of the fundamentals of reviewing, a well articulated opinion, and the knowledge to convey your first impressions with clarity. 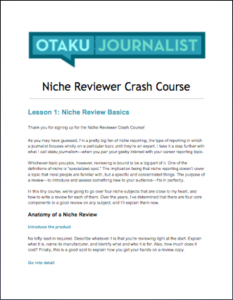 I created the Niche Reviewer Crash Course to give you a head start. It’s a self-guided course for learning one of the most valuable assets in any niche reporter’s toolbelt—the art of the review. Sign up to take this free course by signing up for my newsletter. That means that aside from the course, you’ll receive sporadic, helpful blog updates—plus a first look at other courses and products I’m working on.